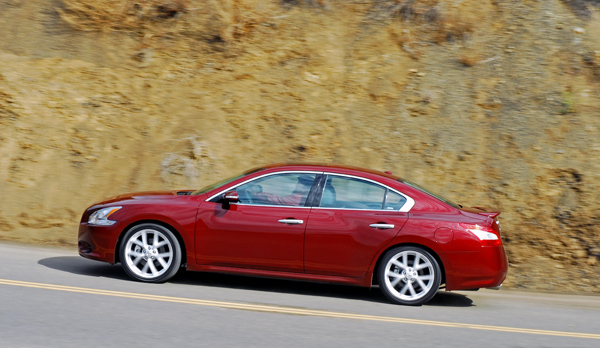 For 2009, Nissan has taken its flagship Maxima into entry level luxury and performance levels not seen before. Designers restyled the body into what Nissan calls ‘liquid motion’, engineers increased power to 290hp, refined the CVT front-wheel-drive transmission, re-engineered the fully independent suspension, and then added stronger braking power. Nissan then designed a new ‘super cockpit’ interior that is more comfortable, luxurious and safer than before. This seventh generation Maxima marks a return to the longtime Nissan flagship sedan’s roots as a commanding 4-door sports car-a vehicle that is unique in both appearance and driving feel, with renewed relevance for today’s active and ambitious sedan buyers. Inspired by the 2009 Nissan GT-R supercar, new Maxima words included addictive performance, striking, commanding and powerful. High targets were established including the goal of creating the best performing front engine, front-wheel-drive car in the world, along with class-leading acceleration, braking, handling, workmanship and cockpit design. After being rated the top-ranked vehicle in Auto Pacific’s 2007 Vehicle Satisfaction Award for entry-level luxury mid-sized car, and a winner of Strategic Vision’s 2007 Total Quality Award, the new Maxima demanded taking risks in order to ultimately come up with a more exciting and rewarding vehicle. Three key areas were singled out for change-exterior design, a ‘super cockpit’ creating an interior that combines a driver orientation with high quality, roominess and user-friendly technology-and class-leading performance. As the designers and engineers set and exceeded higher and higher targets, they realized that confirmation of the results would require validation on the road. Not just any road as members of the development team traveled to Germany’s famed Nurburgring circuit, where the GT-R and other world-class sedans and sports cars are tested, to test Maxima prototypes. Special attention was placed on body rigidity, suspension and steering, along with honing Maxima’s competitiveness against some well-established European sports sedans. 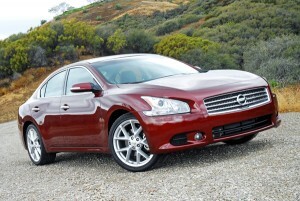 After testing the all-new Maxima for seven days I can attest that they have met most of their performance objectives. While seeking to create a simple-yet-strong presence, the designers of the new car’s exterior also wanted to re-assert Maxima’s breakthrough personality-establishing a ‘wow’ level of style that would clearly distinguish it from segment competitors. The exterior design theme for the car is ‘Liquid Motion’-focusing on the flow of its powerful and beautiful surfaces, like the undulation of a wave. The look starts with Maxima’s aggressive stance and powerful fender volume, which is not unlike many of today’s exotic sports cars. This deeply sculpted body/fender treatment is seldom used in mass market vehicles because of the engineering and manufacturing complexity required to physically accomplish it. Maxima’s new stance is created by a slight reduction in wheelbase and overall length, along with a wider front and rear track. The car’s new looks reveals a strong, premium car presence. The large, wraparound L-shaped headlights add a unique dimension to the overall design, while the light surrounds suggest a powerful ‘turbine’ appearance of energy and strength. The upturned headlight shape combines with a wide, rectangular grille, large bumper opening, integrated foglamps, and bulging ‘catamaran-styled hood that gives Maxima a formidable expression, setting the tone for the rest of the car. 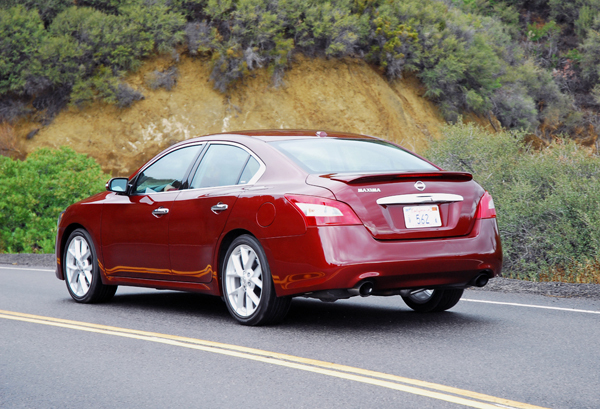 The powerful Maxima form continues along its profile, with careful layering of the bumper, hood and fender parting lines. The polished, elegant motion spreads from the deep-waisted rear fenders through distinctive Maxima-style C-pillars, and a high trunk lid with an integrated spoiler sitting on top. 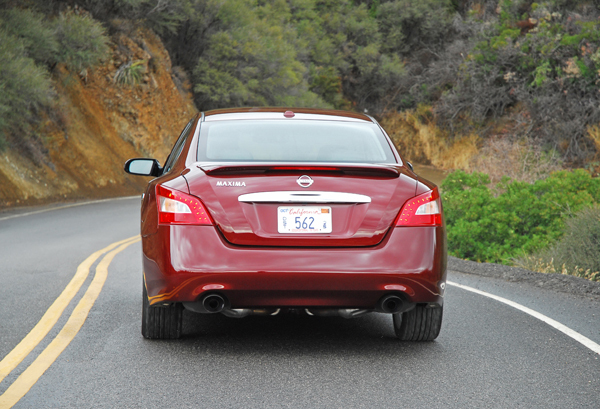 At the rear, Maxima features a new 12-LED L-shaped taillight design with a pair of side marker bulbs for added visibility at night, a molded rear bumper, a chrome strip on the trunk face, and two, 3in. wide, polished stainless steel exhaust tips cut into the bottom of the bumper. Maxima’s breakthrough styling gives it a commanding, almost coupe-like appearance that makes it seem that it was carved from a solid piece of metal. 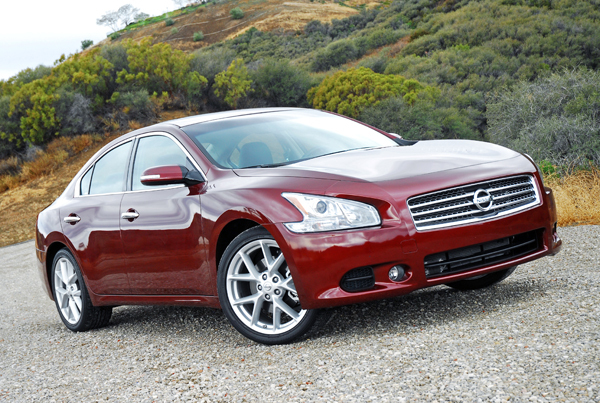 For five previous generations, Maxima has been built on a front-wheel-drive (FWD) platform. Yet with the new Maxima’s development team everything was open for discussion, including the benefits of FWD versus rear-wheel-drive (RWD). Although there are well-known advantages of RWD in terms of sporty handling, it was ultimately decided that by switching from FWD to RWD. With the new Nissan ‘D’ platform, first introduced on the all-new Altima sedan, the target Maxima performance objectives could be delivered-without giving up the added FWD benefits of better traction on slick surfaces, lower costs, lower weight and enhanced roominess. As seen in the all-new Altima, the new Nissan D platform is an amazing piece of engineering-providing responsive handling while virtually eliminating the torque steer often felt in high horsepower FWD applications. 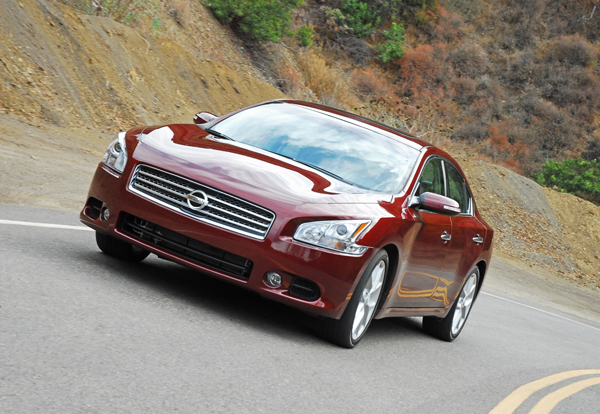 In the Maxima, the platform is refined, creating one of the best-performing FWD car’s on the market. The Maxima body and chassis engineering teams worked together to create a more secure feeling, virtually no torque steer during launch and a level of nimbleness that makes the car more fun-to-drive. A range of enhancements helped achieve these targets, including increasing body rigidity and adjusting the wheelbase and track dimensions. Body rigidity was increased by 15% and front strut mounting rigidity was increased by 100%, with all-new structures added to the engine compartment and additional reinforcements applied to the instrument panel structure. 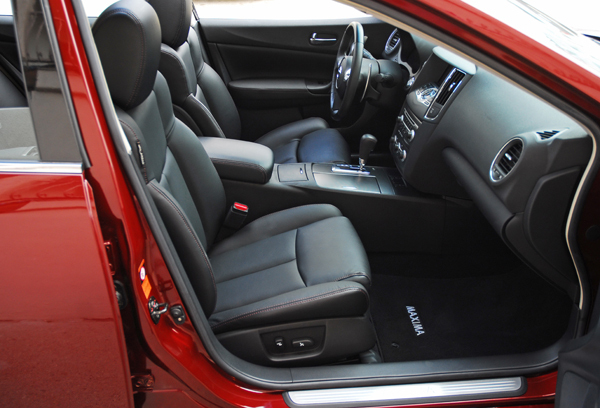 Maxima’s equipped with the Sport or Premium Packages feature a panel behind the rear seat that improves torsional rigidity by 17% versus models equipped with a fold-down rear seat (a rear trunk pass-through is utilized with this panel). Additional ‘D’ platform enhancements include the use of aluminum suspension links, revised suspension geometry, new technology shocks, revised steering and suspension geometries, a lower engine mounting and application of a new Xtronic CVT (continuously variable transmission), all of which contributes to minimal torque steer and improved handling characteristics. Compared to the previous model, the new Maxima offers more horsepower and torque, providing quicker acceleration response and a special ‘Maxima Sound’- a low, sporty growl exhaust note. The revised 3.5 liter VQ-series V6 features a modular engine design with micro-finished crank journals, and cam lobes, molybdenum coated lightweight pistons, a resin intake collector, digital knock control, six individual coils, continuously variable valve timing control system (CVTCS), a variable induction system, a silent timing chain electronic throttle control, and a cross-flow coolant pattern. This newly refined 3.5 liter V6 now generates 290hp and 261lb.ft. of torque. Significant development time was also spent on enhancing the sporty engine sound for an increased ‘exhilaration feeling’. The new Maxima also utilizes additional sound absorption material and a new ‘sound creator’ to enhance induction sound. Noise, vibration and harshness (NVH) has been lessened by adopting a new six-point engine mounting system. All Maxima’s come equipped with a revised Xtronic CVT with manual mode, tuned specifically for Maxima’s sporty driving character. The Maxima development team finessed the previous CVT design to improve responsiveness and strike a balance between sport and comfort, ultimately creating a transmission that provides a true synergy between engine and transmission, along with smooth, responsive and efficient operation. The Nissan CVT is the best I have ever operated in terms of no ‘whining noise’ during operation and crisp, sure shifting. For drivers seeking the utmost in vehicle control, a new ‘Ds mode’ (drive sport) has been added to the CVT for 2009. ‘Ds mode’ is an electronic control logic, that enhances sport driving through increased acceleration feel with higher engine revolutions, automatic engine braking and maintaining engine speed during cornering. Ds mode takes advantage of the CVT’s infinite selections of available gear ratios and is able to select the right gear, the right time, all the time. This enhances the emotional, sporty feel while driving on canyon roads or city streets. Whether it is upshifting or downshifting, Ds mode is able to match vehicle speed and engine rpm with your intended acceleration input. Ds mode, combined with the sound creator, creates an exciting experience not available on any other CVT vehicle. Adding even more precision to high-speed maneuvers is the optional ‘paddle shifters’ that are mounted on the steering column, allowing manual transmission shift changes for varying situations-such as winding roads-while your hands remain on the wheel for optimum vehicle control. EPA fuel economy is about 19mpg/city and 26mpg/highway, which is not bad for a mid-size, luxury performance sedan. The Maxima’s fully independent suspension has been designed to be both stimulating and relaxing, combining responsive handling with a comfortable ride over poorly paved roads. The subframe-mounted strut/coil spring front suspension makes extensive use of lightweight aluminum parts. An X-type upper cowl structure helps establish front body rigidity for suspension mounting. Maxima’s multi-link independent rear suspension design, also subframe-mounted, offers outstanding handling by minimizing camber change during cornering. The rear shock absorbers and springs are separated for minimized friction, and the shocks are in line with the center of the rear wheels, providing excellent damping and minimal harshness. Front and rear stabilizer bars come standard and help minimize any front and rear body lean during high-speed cornering. Strong braking is provided by standard 4-wheel disc brakes with a 4-channel, 4-sensor, 4-wheel ABS with electronic brake force distribution and brake assist. The front and rear brake rotors are larger and vented for maximum braking power and less fade during constant braking situations. The car also features a new twin orifice power steering vehicle speed-sensitive power rack & pinion steering system, similar to that utilized in the Nissan 350Z. The system features high accuracy gear, which is designed to offer improved high performance response, along with ease of driving at low speeds and a stable feel at high speed. It gives you a well-connected feel when at the wheel. 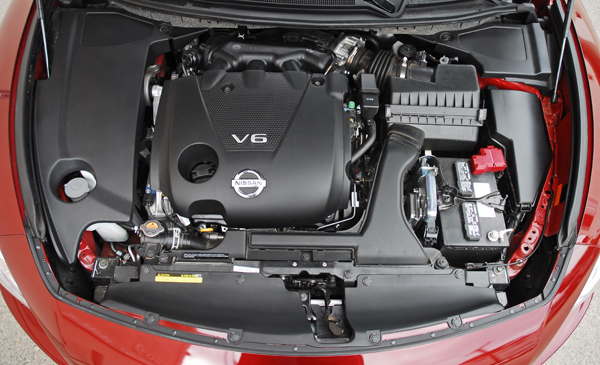 A new strut tower brace also contributes to Maxima’s improved steering precision and rigidity. Every 2009 Maxima offers standard 18X8in. aluminum alloy wheels and V-rated 245/45R18in. all-season tires. The Maxima 3.5 SV Sport Package, that I tested, came shod with wheel-well stuffing 19X8in. aluminum alloy wheels wrapped with 245/40R19in. all-season performance tires for enhanced traction and grip. With major improvements in engine power and torque, a refined CVT transmission, sport-tuned suspension, a tuned performance exhaust, the virtual lack of torque steer, nimble handling, controlled body movements and linear steering and braking feel, all add up to Maxima standing out as the most exciting and exhilarating performance sedan to drive in class. Another challenge in designing a true sports sedan is creating an attractive, intimate, sporty cockpit feel for the driver without compromising the traditional sedan attributes of passenger comfort, roominess, utility and safety. The new Maxima design team developed an interior concept of ‘super cockpit’, but with space-the feeling of a sports car with controls ergonomically close, yet with ample roominess and comfort for both driver and passengers. Key design words emphasized during development were ‘impressive and silky’, ‘high touch’, ‘craftsmanship’ and ‘high tech’. Every aspect of the interior layout, including the size and shape of touch points and placement of features, was improved for a better driving experience. 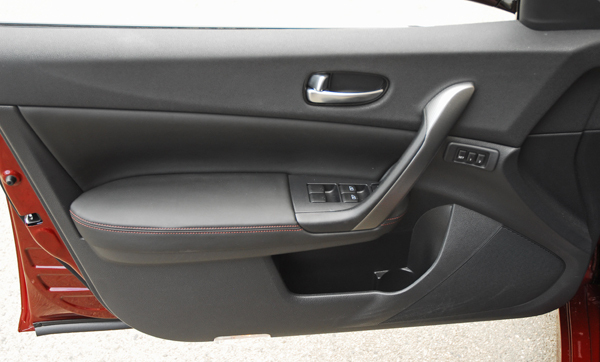 The shifter lever, for example, was placed closer to the driver and falls easily to your right hand. This also allowed cupholders to be placed to the right of the shifter, not behind it. The gate’s manual mode has been moved toward the driver for a more intuitive action. To further enhance the ‘cockpit feel’ of the new interior, the center console has been raised and a premium quality feel is provided through the extensive use of soft touch materials, as well as soft, deep pads where the arm or elbow may rest. The high quality feeling is also expressed with ‘daytime illumination’ electroluminescent gauges, with a special tilting of the tachometer so engine redline is placed at the 12 o’clock position, and extensive use of chrome surrounds for the gauges, vent rings, vent knobs and audio switches. 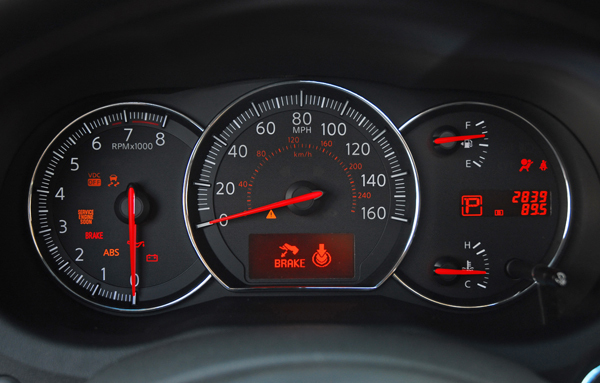 When you push the Engine Start button the gauges cycle to show that they are active and ready to present your speed and engine rpms. The new Maxima’s power tilt/telescoping, three-spoke steering wheel is sport-oriented and its diameter has been reduced, compared to last year’s model, for improved feeling. Maxima Sport and Premium package models feature a unique ‘parallel’ pattern steering wheel stitching for enhanced grip. Much time was spent on designing the best driver’s seat in the segment and includes an optional manual thigh extension for long distance driving, additional support in the side bolsters for good lateral support during spirited driving, as well as added seat height adjustability. 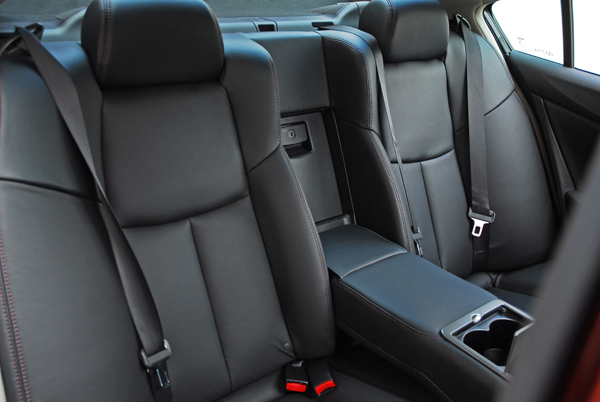 The seat is also available with heating and cooling functions and premium leather-appointed surfaces with special stitching. Also optional are power lumbar and memory function. 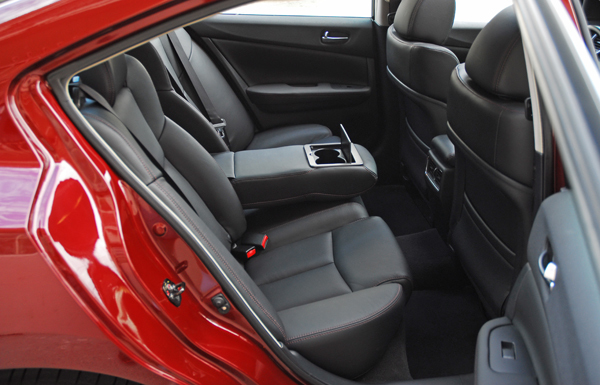 As stated earlier, the new Maxima is available with two different rear seat layouts-a 60/40 fold-down rear seat with access to the trunk, and a fixed rear seat with center armrest pass-through for carrying long items. Comfort and convenience features include a standard sunroof, 8-way power driver’s seat and 4-way powered passenger seat, dual-zone automatic climate control, cruise-control, Intelligent Key with push button start/stop, power windows, door locks, grab handles above all passenger seats, dual map lamps, thick-cut pile carpeting/floor mats, AM-FM-CD6/MP3 audio system with 8-speakers, and illuminated vanity mirrors. Options include 19in. wheels, rear spoiler, HID headlamps, heated outside mirrors, automatic entry/exit system with two-driver memory, heated front seats, Bluetooth hands free phone, XM satellite radio, premium leather seating surfaces, Eucalyptus wood trim, Nissan Hard Drive Navigation System with 7in. screen, rear TV parking assist and a Bose Surround Sound Audio System with 9-speakers and two subwoofers. Standard safety features include Nissan Advanced Airbag system with dual-stage front airbags, front seat-mounted side-impact airbags, roof-mounted side-impact airbags, front active head restraints, 3-point safety belts for all 5-seating positions, front belts with load limiters/pretensioners, Zone Body Construction with front/rear crumple zone, LATCH system for child seats and Tire Pressure Monitoring system. Nissan’s goal was to keep Maxima relevant to sports sedan enthusiasts and they have certainly reached their marks as this is one of the best look, performing, comfortable, convenience, luxurious and safe sedan in its class. The base price starts at $29,950.00 all the up to $37,415.00 including destination charges for the loaded SV model that I tested. Front Hip Room: 53.4 in. Front Shoulder Room: 56.3 in. Rear Head Room: 36.4 in. Rear Hip Room: 53.9 in. Front Leg Room: 43.8 in. Luggage Capacity: 14.2 cu. ft.